Toshiba Electronic Devices & Storage Corporation has launched “TB9120FTG,” a constant-current 2-phase stepping motor driver for automotive applications. The new IC outputs a sine-wave in electric current using only a simple clock input interface, with no need for an advanced functional MCU or dedicated software. Sample shipments start in November, with mass production scheduled to start in July 2019. TB9120FTG incorporates DMOS FETs with low on-resistance (upper + lower = 0.7Ω (typ. )), which achieve a maximum current of 1.5A. 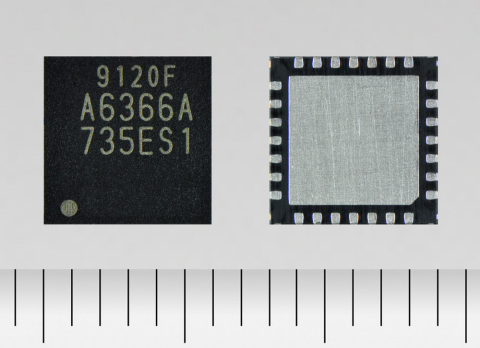 Both the DMOS FETs and the controller that generates micro-stepping sine-waves (supporting up to 1/32 steps) are housed in a small QFN type package (6.0 mm x 6.0 mm). The new IC delivers an operating temperature range of -40 to 125℃, and it will be qualified against AEC-Q100, a certified standard for electronic components for automotive applications. It is suited to a wide range of general uses, including adjusting the projection of heads-up displays and various valve controllers. – Advanced functional MCU or software are not required to output sine-waves. Micro step drive, supporting up to 1/32 steps. – A detection signal is output from a dedicated pin after detecting a stall. – Mixed decay mode ensures stable current flow through the motor. Motor stall: When motor rotation deviates from the control signal, stalling occurs and the motor stops rotating.